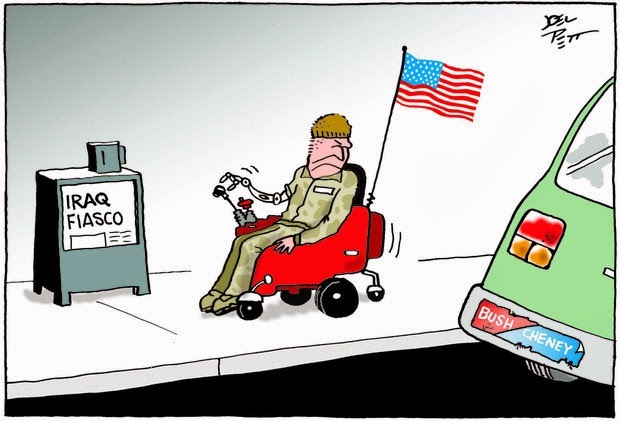 Well, at least the vet in Joel Pett's cartoon has a prosthetic arm and a power wheelchair. What he doesn't have is a job or training to find a job. That kind of stuff just isn't in the budget. The Veteran's Administration just doesn't have the money. And Congress has decided that the federal government doesn't have the money to extend unemployment benefits. That means that those who lost their jobs during the "Great Recession" won't have even that minimal cushion to sustain themselves and their families while they struggle to find a job, any kind of job. We've been assured that the economy is recovering, and the primary proof offered is the Dow Jones numbers, the highest in history. Somebody is making money, just not the government (apparently) and those who are still unemployed. I guess the American Dream is only for the denizens of Wall Street and the CEOs of the Fortune 500. The rest of us? Maybe next year. So happy to see "you"! What we have is a maldistribution problem. There is planty of money floating around. It just fetches up at the top of the asset/income hierarchy before enough of it reaches the bulk of the citizenry. For many, there is no next year. It is a dream deferred for a life time.